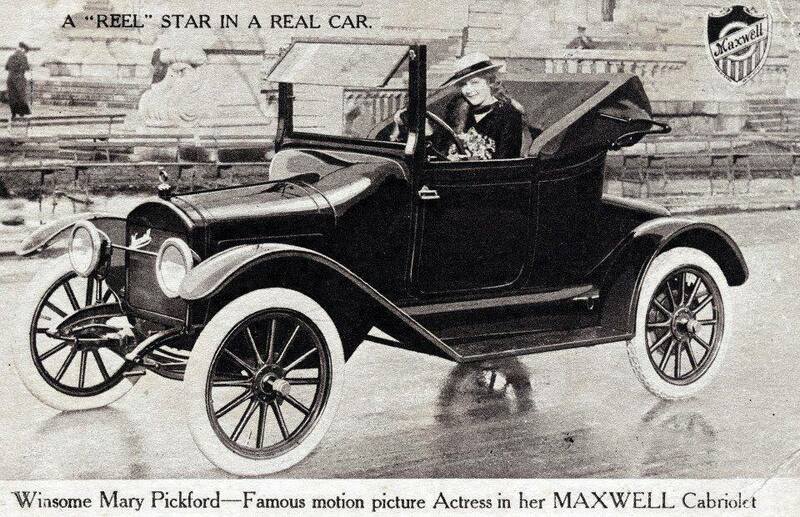 PHOTO: Mary Pickford, who has starred in six films so far this year, “Tess of the Storm Country” and “Hearts Adrift” among the most noteworthy, driving her new Maxwell Cabriolet. December 15, 1914: The Maxwell Motor Company’s salesroom on “Automobile Row” at Broadway and Fifty-ninth Street in Manhattan took on a delightfully feminist air today. The company inaugurated its new policy of employing women to demonstrate and sell automobiles – and will even be paying them on the same basis as men. On hand to take part in the festivities were a number of noted suffragists, including Mary Garrett Hay, president of the New York City Woman Suffrage Party, and Crystal Eastman, a founding member of the Congressional Union for Woman Suffrage. Inez Milholland Boissevain, a conspicuous presence at every major suffrage parade since 1911, introduced the speakers, all of whom were quite enthusiastic about the opportunities for women in the automobile field. They expressed confidence that this experiment would prove successful and bolster their contention that women are quite capable of doing well in any field if only given the opportunity to prove themselves, and be judged solely on the basis of ability. The suffragists were also quite impressed by the hours and working conditions here, and it is hoped that this enlightened attitude will spread to other companies and industries. As a practical example of women’s mechanical abilities, Jean E. Moehle, who recently graduated from Barnard College, spent the afternoon in a leather apron disassembling and reassembling a motor, to the fascination of the crowd. Mabel Wiley demonstrated her abilities as well, by making her first sale before the reception was over. Selling any of the new Maxwell “25” models should be an easy job. By producing in volume (37,000 new 1915 models ordered by dealers between their introduction on August 1st and mid-September) Maxwells can be purchased at the lowest of prices. A 4-cylinder, 186 cubic inch, 21 horsepower Roadster can be bought for only $670, a 5-passenger Touring Car for $695, a Cabriolet for $840, and even a Town Car runs only $920. For just $55 more, any of these models can have electric, rather than gas headlights, and an electric self-starter as well. So, if you want to buy a new car, and would also like to get a good bargain, as well as help women break into a rapidly growing field, there’s now a place where it’s possible to do all three at the same time!